In all cultures, flags symbolise distinction and independence. They epitomise the history of the nation they represent and express the heritage it most treasures. Arab, Jordanian and Hashemite flags are banners of glory, and the culmination of a bright history since the time of Prophet Mohammad, peace and blessings be upon him, which today is embodied in the Flag of the Hashemite Kingdom of Jordan, the Flag of His Majesty the King and the Hashemite Banner. Prophet Mohammad, peace and blessings be upon him, had two flags — white and black — which have been mentioned and described in several literary sources. The author of “Al Sira Al Halabiyah” (The Aleppine Prophetic Biography) wrote, in reference to Badr Battle, that there were two banners, black and white, before the Prophet, peace and blessings be upon him; one black, carried by Ali bin Abi Taleb, may God be pleased with him, that was called Al Oqab; while the white flag was that of Al Ansar of Medina Munawara. Ibn Ishaq said the Prophet, peace and blessings be upon him, gave a white banner to Musaab bin Hashem bin Abd Manaf, while Abu Hurairah said the white flag had the phrase “La ilaha illa Allah; Mohammad rasoulu Allah” (There is no God but Allah; and Mohammad is His Prophet) emblazoned on it. In the first year of the Hijri calendar, when Muslim troops moved to intercept a caravan from Quraysh, the Prophet, peace and blessings be upon him, gave a white banner to Abi Murshid, and it was the first flag to be hoisted in Islamic history. At the conquest of Mecca, in 8 Hijri, the white banner was carried through the gates of Mecca, alongside Arabs’ other flags. The two white and black banners were also used under the reign of the Rashidun Caliphs (632-661 AD), with the conquering armies carrying them in all their battles. Al Muthanna bin Haretha was known for his black flag, while Khaled bin Al Walid was recognised for his green banner; Saad bin Abi Waqqas had a red flag, whereas Osama bin Zayd had a white flag. Muawiya bin Abi Sufian began the reign of the Umayyad state in 661 AD, taking over from Al Hassan bin Ali, may God be pleased with them, after the arbitration incident in Jordan’s Athruh in 36 Hijri. The Umayyads used the white banner as their flag, taking inspiration from the conquest of Mecca and the victory of the Prophet, peace and blessings be upon him. The Abbasids fought the Battle of the Zab against the Umayyads in 750 AD and defeated them. Their state began to take shape when Ali bin Abdullah bin Al Abbas marched from Humaima in Jordan towards Baghdad. The Abbasids hoisted the black flag in reference to the turban of the Prophet, peace and blessings be upon him, and the ‘Oqab’ banner, as well as in memory of those of Aal al Bayt (descendants of the Prophet, peace and blessings be upon him), whom had been martyred. Abdullah Al Mahdi Al Fatimi established the Fatimid state in the Maghreb after routing the Aghalibah state in North Africa in 909 AD. His state extended into Tripoli, Barqa and Tunisia. Al Muizz Lidin Allah Al Fatimi later took over, extending control to Egypt. His army commander, Jawhar Al Siqilli, built the city of Cairo. The Fatimids used green for their banner, in reference to the green of Prophet’s jubba (overcoat) that Ali bin Abi Taleb, may God honour him, wore as he slept in the bed of the Prophet, peace and blessings be upon him, when the pagans of Mecca sought to assassinate Prophet Mohammad, peace and blessings be upon him, but they retreated when they realised Ali was staying in his home. 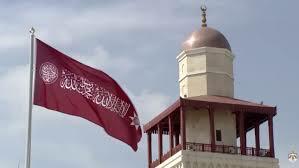 The Hashemites have hoisted the dark red flag as their banner since the time of Sharif Abu Nami, in the period 1515-1520 AD, during the reign of the Ottoman Sultan Selim I. In his book “What I Have Seen and Heard,” Khair Eddin Al Zarkali wrote that Al Hussein bin Ali was seeing off his son Prince Abdullah, who was heading to Maan in 1920, when the red flag of the Ashraf was carried at the front of the Prince’s army. Assayed Al Bakri writes in “Al Sahareej” that the red banner was that of the people of Hijaz. When the Great Arab Revolt erupted, Sharif Hussein bin Ali notified the Allies that the uprising’s flag will be the red one, until an official banner is adopted and announced to all states. A year after the eruption of the Great Arab Revolt, a military show was held under the patronage of Prince Faisal bin Al Hussein in Al Wajh area, where the new Great Arab Revolt banner was hoisted for the first time. Prince Faisal presented it to Commander Rashid Al Madfaai; and an oath was taken to ensure that the flag would always fly high. The 82nd Issue, Al Qibla newspaper, which documented the events of the Arab awakening and what came afterwards, published a statement detailing the description of the Great Arab Revolt banner. It said that the new flag is made up of a dark red chevron, connected to three horizontally parallel colours: black on top, followed by green and then white. The banner signifies the glory of Arabs, as it intertwines with that of the Hashemites, which has built on the Revolt’s great legacy. The Great Arab Revolt forces were marching to liberate Arab lands and to hoist the flag of the independent Arab state; therefore, the Revolt’s banner was flying in Hama, Aleppo, Latakia, Beirut, Damascus and Mount Lebanon. Prince Mohammed Said Al Jazaeri also announced support for the Arab state and the Great Arab Revolt from Damascus. The flag was hoisted at the municipal and government headquarters on 1 October 1918, ushering in the rise of the Arab state. Upon Prince Faisal’s entry into Damascus, work began to build the state’s institutions and hold elections in the Levant. The Syrian National Congress convened on 8 March 1920, and it was decided on the same day that the Syrian state’s flag would be the Great Arab Revolt banner, with the addition of the heptagram at the centre of the chevron, signifying the fact that Syria was the first independent Arab state to emerge through the Arab awakening movement and the Great Arab Revolt. The heptagram represents the seven areas of Syria: Damascus province, Beirut province, Transjordan, Palestine, Mount Lebanon, Aleppo and the Jerusalem sanjak (district). The Iraqi people wanted to have an independent monarchy since the Arab Kingdom of Syria was announced on 8 March 1920. After the Battle of Maysaloun and the subsequent political developments, King Faisal was proclaimed King of Iraq on 23 August 1921. After the state’s institutions were fully formed, King Faisal issued a decree in 1924 calling for establishing a Constitutional Council, which decided to keep the Great Arab Revolt’s banner as the Kingdom’s flag, provided that the chevron becomes a trapezoid, with two heptagrams placed in it, and the white stripe moved to the middle of the flag. The two heptagrams indicate that Iraq is the second state to emerge under the Arab Hashemite State in Hijaz. Their 14 points represent Iraq’s provinces: Mosul, Kirkuk, Sulaymniyah, Erbil, Baghdad, Diyala, Hillah, Karbala, Edleim, Basra, Al Diwaniyah, Al Kout, Al Muntafiq and Amarah. The two heptagrams also point to the dual nationalism of Iraq, as it is a state of Arabs and Kurds. Black (from top): The Oqab (eagle) banner, which was the flag of the Prophet, peace and blessings be upon him, and the flag of the Abbasid state. White (centre): The Umayyad state’s flag. Green (bottom): The flag of the Fatimid state (also the emblem of Aal al Bayt). Red (the chevron): The banner of the Hashemites since the time of Sharif Abu Nami. White heptagram: Symbolises the seven verses of Surat Al Fatiha, the opening chapter of the Holy Quran, signifying monotheism; the sublimity of humanity, nationalism, humility, social justice, honesty and achieving goals and aspirations. Its length shall be twice its width; and the Flag of Transjordan, as described in the Basic Law, will be placed in its centre, resized to one-third of the Prince’s Flag and placed within a white oblong towards which 24 rays extend along its circumference. The length of each of the four rays in the corners of the flag shall be a seventh of the flag’s length, while their width shall be one-seventh of its width. The upper borders of the upper rays and the lower borders of lower rays shall be part of the connecting line to the central flag’s corners. [Five] rays shall be placed between each corner, and their length will be one-seventh of the flag’s length, while their width shall be one-seventh of the flag’s width. The internal bases of the four rays in the corner shall be equal to three-fourteenth of the width of the central flag, while the five rays at the two edges of the flag shall be equal to one-seventh of the width of the central flag. The five upper rays and the five lower ones between the ones in the corner shall be one-fifth of the length of the central flag. The colours of the rays, starting from the upper corner at the hoist shall be black, followed by white, then green then white, then red, repeating at this pattern. Sharif Abu Nami was the first to hoist the Hashemite banner in its present shape and dark red colour in 1515 AD. Prince Abdullah also hoisted it when he headed to Maan in 1920. It was also used as the flag of the Great Arab Revolt, led by Sharif Hussein bin Ali, before the official banner was adopted. The shahada (There is no God but Allah, and Mohammad is His Prophet): to signify monotheism and mercy. The basmala inside the heptagram (In the name of Allah, Most Gracious, Most Merciful): Everything starts with the basmala, while the heptagram symbolises the seven verses of Surat Al Fatiha, the opening chapter of the Holy Quran; it also refers to the seven heavens and is a symbol of the Hashemite Monarchy. “Al hamdu li Allah rab al alameen” (Praise be to God, the Cherisher and the Sustainer of the worlds): An expression of gratitude to God that is said after completing any action. The dark red: symbolising sacrifice. The Thuluth, one of the most beautiful Arabic Islamic scripts, was chosen to embroider the various slogans on the banner. On 9 June 2015, His Majesty King Abdullah II, the Supreme Commander of the Jordan Armed Forces-Arab Army, presented the Hashemite Flag to King’s Military Adviser and Chairman of the Joint Chiefs-of-Staff at an auspicious military ceremony in the courtyard of Al Husseiniya Palace in Amman. The flag was then added to the flags and banners in the collection of the Jordan Armed Forces-Arab Army.